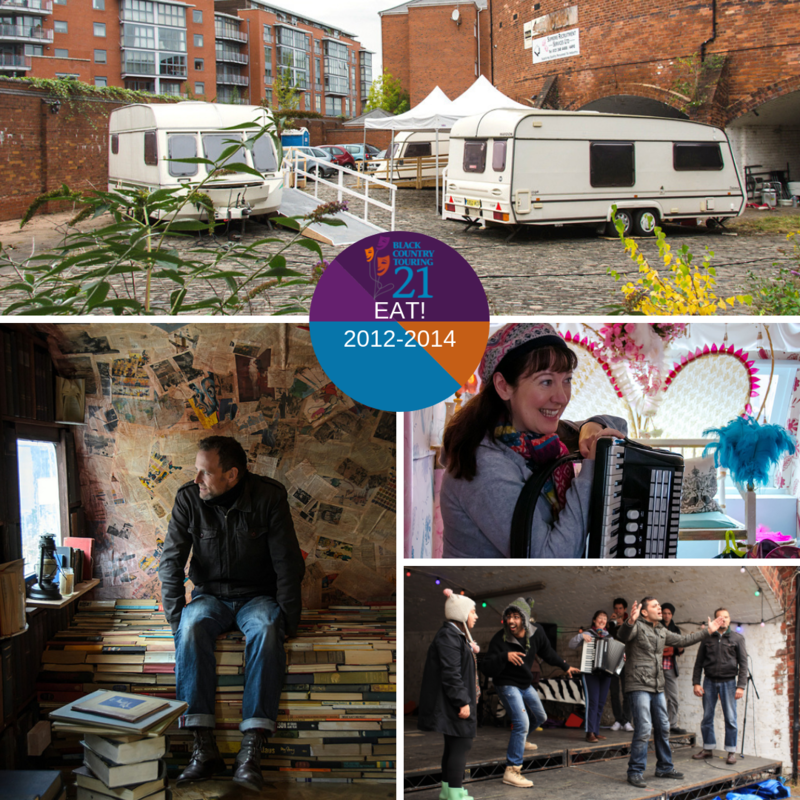 This memory came from Steve Johnstone, Co-Artistic Director of Black Country Touring. One of my strongest memories of preparing a show was Eat! and that’s because all of the latter stages happened onsite by the canal in the centre of Birmingham. We were using the Roundhouse canal side courtyard. It hadn’t been used for years and was full of huge bushes. The caravans were pulled into them and space cleared to begin work, but it always felt like we were camping. We had no running water and portaloo toilets. It was November time so a damp and misty autumn was giving way to a damp and cold winter. Everyone went around in layers of clothes and whenever the cold sun popped out we stood in it, soaking up any extra warmth. The company spirit was fantastic. We had all the usual problems of making a show – finding characters, learning lines, songs and choreography – and added to that how to run a complex show off a single generator, levelling caravans on cobbles and amongst bushes, making stages in arches, avoiding the rain, enjoying the sun… In the end the performances were magical. The low festoon lighting gave a carnival feel. Audiences felt invited into a special world that only the chosen would enter. The outside was full of song and colour – the insides, intimate, personal – each caravan a different world. For me there are so many memorable moments, but the one I will remember best will be standing outside a caravan inside which a deeply moving story from the Bosnian war was being recounted. I was there with various members of the brilliant community choir who were part of the show, waiting for our cue to start singing a Bosnian lullaby as underscore to the story unfolding inside. I remember our breath forming in the cold night, the lights on the canal, the beautiful sound and then the slow quiet stepping away from the caravan of the choir, as our part finished. It summed up Eat! for me – so many people were part of making it happen – the people who’d given their stories, the people who’d designed and made the caravans, the interviewers who had collected the stories, the crew and stewards who supported it all as well as the performers delivering it. We were all part of making it happen, but like the choir around the caravan it was important that the audience didn’t think about what we were contributing just absorbed it in the still, chill night, immersed in the moment.